Back pain affects 80% of Americans at some time in their lives. Lincoln, NE, call the experts at Spine and Sports Chiropractic today. Back pain comes in many forms. From lower back pain, middle back pain or upper back pain, there’s only one thing you’re thinking about—getting relief. Spine and Sports Chiropractic’s staff of experts will help alleviate and treat all types of chronic back pain. Back pain is commonly caused by nerve and muscular problems, degenerative disc disease and arthritis. What are symptoms of back pain? Symptoms of back pain include persistent aching or stiffness anywhere along your spine. You may also experience sharp pain in your neck, upper back or lower back—especially after lifting heavy objects. Chronic aches in your middle or lower back are also common—especially after sitting or standing for a long time. Basic back pain can usually be treated with pain medication or painkillers. For more advanced, or chronic back pain, you should schedule an appointment so we can properly diagnose the back pain and provide treatment options. Active Release Technique (ART), chiropractic adjustments and physical rehabilitation stretches and exercises will usually alleviate and resolve all back symptoms. Back pain affects 80% of Americans at some time in their lives. In many cases, back pain is the result of overextending or straining the muscles in your lower back. For effective back pain treatment in Lincoln, NE, call the experts at Spine and Sports Chiropractic today. Intense, sharp, stabbing pain is noticed especially with deep or quick breathing. A small local area in the mid back on one side is suggestive of rib pain. Pain between the shoulder blade and spine is common place and has many reasons. One of the more common reasons that we find with an exam is a Dorsal Scapular Nerve Entrapment. 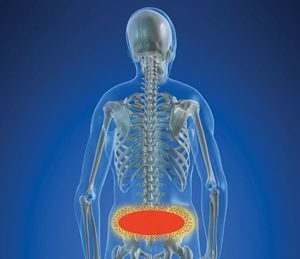 Sacroiliac Joint Pain is described as a dull pain around the dimple area of the lower back/upper buttock almost 100% of the time. That pain will increase in intensity when the person arches backwards or lies on their belly. If it is painful to bend forward and you are having sharp pain, then you likely have an injured disc. Symptoms that indicate disc injury include: pain being worst in the morning, riding in a car is painful, standing. Pain in the front of the hip or deep in the abdomen are the most common symptoms. The pain worsens when sitting, going upstairs or lifting a leg up in the air while standing.